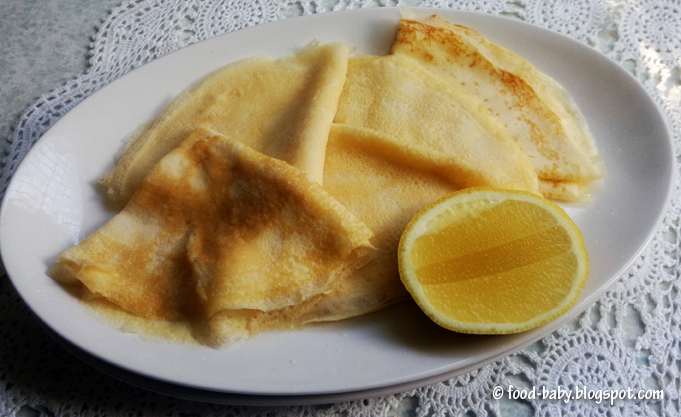 My Wholefood Family Essentials: Crepes for Bastille Day and a blogiversary! Happy Bastille Day! And happy blogiversary to me! It's been 4 years and 285 posts since I started this little blog. I had zero clue about what I was doing or where I wanted to go with this, all I knew was that I loved to bake and wanted to share that with my little corner of the interwebs. You can find my first post here. Read it and cringe along with me! I definitely lost my blogging mojo after the boys were born but now that they are a little older I have a bit more time and am committed to posting at least twice a week and broadening my food horizons. To all my lovely readers and followers, thank you for sticking with me! In honour of Bastille Day today we made crepes for breakfast served my favourite way, with a squeeze of fresh lemon juice and a sprinkling of sugar. Delicious! Place the flour in a large bowl along with the eggs, salt, oil and 2 tbs of the milk. Whisk until smooth then add in the remaining milk and beat well. Refrigerate for 30 minutes. Place a heavy bottomed frypan over medium heat. Grease with a small amount of butter. Pour about 1/8 cup of batter into the pan, tilting to cover evenly. Cook for about a minute, or until the top is dry. Flip and cook on the other side for 10-20 seconds. Turn out onto a plate and repeat until all the batter is used. Makes approx 10-12.